I love vegetables. I was never that kid who was made to stay at the table until I ate all my lima beans or cauliflower. I always cleaned my plate and asked for seconds when it came to healthy greens so I’m always cooking them up for myself as a nice side dish or an entire meal. This past weekend, I bought some fresh, locally grown asparagus at the farmers’ market. So, I steamed some up to enjoy Saturday evening. As I lifted the lid and pulled the fresh stems out of the pot, I heard Truman walk up beside me. He planted himself right next to me and looked up as if to say, “Whatever you just cooked smells really good, and I would like some too, please.” I know that pose well, so I checked to see if asparagus is OK for dogs to eat. It is indeed, in moderation, of course. So, since it was steamed, I didn’t need to worry about any added salt or butter or spices. I just took a stalk and cut it up, and he gobbled it down like it was a treat. Truman also does this when I cook sweet potatoes and green beans. He adores sweet potatoes and green beans. He loves cooked carrots but won’t eat them raw. Likewise, he’ll eat raw (or frozen) broccoli but doesn’t like it cooked. He’ll also eat a slice of apple and on rare occasion, a slice of banana. He turns his nose up at melon, strawberries, and blueberries. I read somewhere that our bodies crave the food items that we are lacking. For example, if you have a craving for peanut butter, it’s your body’s way of telling you that you might need protein. It you really want a banana, your body needs that potassium. If you’re craving a Snickers bar, it probably means you’re normal. The same holds true for the animal kingdom. I was curious as to why Truman was so interested in my asparagus, so I looked it up. It’s a fabulous source of Vitamin K, which is good for blood and bone health. It contains tons of antioxidants and has anti-inflammatory properties. It’s high in fiber and nourishes the digestive tract. And it’s high in Vitamin B1, thiamine, which helps with metabolism. For whatever reason, Truman knew that my steamed asparagus was something he wanted … something he needed. He knows that sweet potato fresh out of the oven is something his body needs as well. 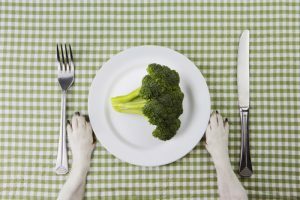 I just learned a healthy eating lesson from my dog! It’s simply to really pay attention to what my body is telling me it needs. Not what it wants, but what it needs. There’s a difference. So the next time you’re shopping the farmers’ market and that bunch of kale is calling your name, listen!